What is the treatment for dental phobia? It is not an exaggeration to say that most people are reluctant when it comes to visiting a dentist. Fear from a dental visit is particularly true in the case of children. However, many adults are anxious or even horrified when entering the dentist’s as well. The fear or anxiety caused by a dental visit or intervention is known as “dental phobia” or “dentophobia” by medical terminology, depending on the level of distress. Fear from a dental visit does not necessarily mean that the patient is suffering from dental phobia. Whether or not we are dealing with a phobia may depend on several factors. For example, many people only feel stressed about a dental visit if an actual intervention is about to take place, because it often involves a certain level of pain. Others, however, might be terrified by the thought of a routine treatment itself. For patients who they feel great distress even during routine treatment we can use the term “dental phobia”. Children of course are generally afraid when going to the dentist’s, especially when it is their first visit and they are not sure what to expect. A certain number of children may actually have dental phobia, but unless their anxiety results in serious symptoms, they do not necessarily have phobic anxiety. Fear from a dental visit or intervention might result in several symptoms. For example, patients might start sweating or shaking in the waiting room, or even feel sick or nauseous. Whether it is dental phobia we are dealing with depends on how serious these symptoms are. While sweating can be caused by anxiety, nausea indicates that the level of distress is much more serious. In extremes cases patients might even experience panic attacks, though this happens fairly rarely. Dentophobia is regarded as a common problem in medical science. Still, it can have more severe consequences in the long term. People suffering from dental phobia tend to visit the dentist only when their condition has already worsened. As a result they are more likely to have gum diseases or dental plaque. They may even have to deal with heart problems after a certain period of time. As dental treatment can be very costly, we must also consider the financial side of the problem. If patients wait for too long, they may need further treatments or interventions. For example both Root canal treatment and installing a dental crown entail high costs. So the economic consequences might help patients to overcome their distress and ask for medical care. The possible inconvenience and pain of a dental visit or intervention are often the main cause for someone to develop dental fear or phobia. There are, however, other potential factors as well. Many patients tend to feel ashamed or embarrassed during treatment because the dentist is examining their oral cavity which is, after all an intimate part of the human body. This embarrassment can become even more serious when the patient has damaged or discoloured teeth or bad breath as a result of the condition of their teeth. Some patients might feel distressed by the doctor’s presence itself: the dentist is only inches away from their face during treatment which can make them really nervous. Beside the pain and the shame patients may have to face during dental treatment, a negative experience, or certain psychic problems like feeling of helplessness can also lead to dentophobia. Fortunately, the difficulties caused by dentophobia can be tackled in several ways. First, it is important that the patient finds a reliable dentist to whom they can turn to without hesitation; someone who is able to establish an appropriate doctor-patient relationship. 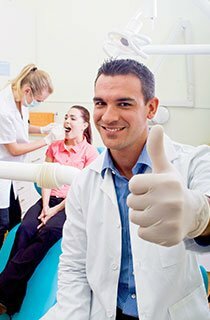 Qualified dentists may also apply special methods to ensure a calm environment; such methods include different relaxation techniques that help patients overcome their fears. Clinics may even employ psychologists who assist the dentist’s work to deal with psychic problems. In case the dentist finds medication necessary, patients suffering from dental phobia can be prescribed anesthetics, painkillers or mild sedatives. In case the dental phobia persists, dental treatments can be carried out under general anesthesia. In this case, the patient does not feel any discomfort or pain during the operation or treatment, and does not hear anything. The inner tension disappears, just a good sleep remains as a memory of the dental treatment.